As we all know, the Darkrunner would be one of the most popular class in Archeage. It is easy to know that Darkrunner has strong powerful in PVP. The skill sets combination is:Battlerage + Shadowplay + Auramancy. 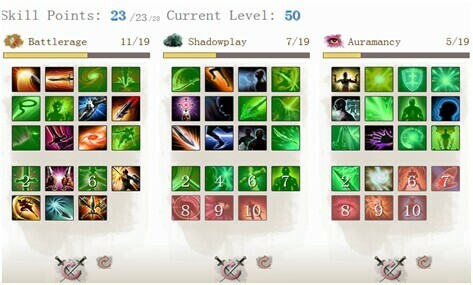 Now, we are glad to share the guide of Darkrunner Build in PVP and how to choose the powerful Archeage items. Frenzy is insanely powerful to against anyone in PvP which can stack up to 10 times at 10 stacks, you will hit 6k precision strikes even with terrible gear. Battlefocus is very important in any engagement to get the extra parry which can pop the passive from battlerage to get your CD's back. Your strongest buff is by far frenzy, any Darkrunner should use it! Two hand for more DMG and shorter fights while leveling, Dual Wield is better in the current meta due to peoples gear isn't as good so you don't need the high raw output to go through, the dual wield passive is more useful. With DW I used a Unique PvP-Nodachi Sword which has high DPS with max temper and the 350g honor crafted sword which has a stun use effect and powerful. The 15% attack speed, thwart, and added stun from my off hand has raised the bars for me when it came to have fun and absolutely destroy people in arenas and world pvp. I have to say being good with DW would mean you have a good main hand and decent offhand for stats or usage. Next: MAPLESTORY 2 GAMEPLAY REVEAL IS A COLOSSAL LETDOWN WHY?